LEXINGTON, Ky. (Feb. 6, 2019) — The Von Allmen Center for Entrepreneurship, part of University of Kentucky’s Gatton College of Business and Economics, invites students, faculty and staff from across campus to Bootcamp 2.0's Session 6 event 5 to 7 p.m. Thursday, Feb. 14, in Woodward Hall, Room 307 of the Gatton College Building on campus. A panel of entrepreneurs will be talking about the lessons they learned throughout their startup ventures. Shane Hadden, entrepreneur and finance lecturer at Gatton College. This session also is open to citizens from around the Central Kentucky community. Seating is limited and you must RSVP to reserve your seat. Click here to RSVP. 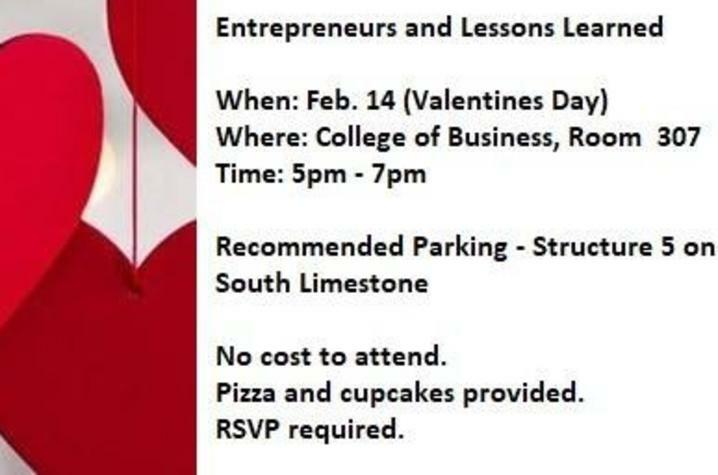 Pizza and Valentine's Day cupcakes will be provided. Cupcakes courtesy of Caramanda's. It is highly recommended that all attendees park in Parking Structure 5.